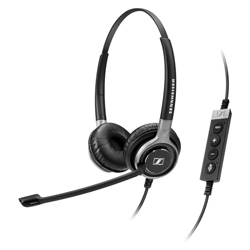 This is a Premium wired headsets designed specifically for all-day use with Unified Communications (UC) and softphones in busy contact centers and offices. It works wonderfully with speech recognition software as well. Built to withstand the rigors of the toughest contact center or office, they are designed for quality-conscious professionals requiring HD voice clarity, durability and all-day comfort. Users can manage calls seamlessly through the call control unit and enjoy the stereo sound quality from the high quality neodymium speakers. Comments: Although designed for the quality, functionality and comfort needs of a call center product, this microphone also works well with speech recognition software and internet telephone applications. We particularly like the controls which allow simple muting of the microphone and volume control. From Louis of Los Angeles, California on 7/20/2017 .